Doors, board and fittings supplier Hill’s Panel Products (HPP) has invested £3million into a second production line to increase manufacturing of its vinyl-wrapped doors. The production line enables Oldham-based HPP to increase output of its bespoke vinyl-wrapped doors from 30,000 to 45,000 units per month in the short term. However, in the longer term, it can increase manufacturing to 50,000 per month or more. The new line contains automated routing, cleaning, glue spraying and vinyl-wrapping machinery. 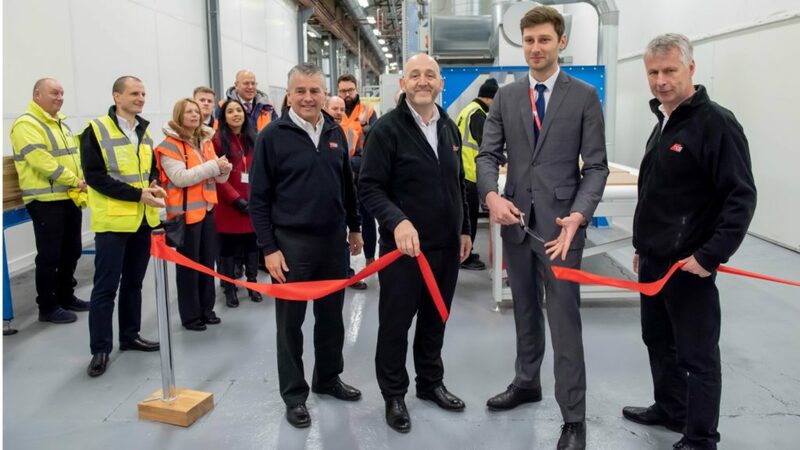 To launch the facility, HPP invited Oldham West MP Jim McMahon and Cllr Sean Fielding, leader of Oldham Metropolitan Borough Council, to a ribbon-cutting ceremony and site tour. HPP managing director Keith Wardrope said: “It’s great to see people of such high calibre and enthusiasm as Jim McMahon and Sean Fielding taking time our of their busy schedules to visit HPP. The expansion comes amid commercial growth for the business, as its sales grew 16% last year, on top of 15% the year before, with door sales rising by 30%. Company chairman Stephen Hill added: “We manufactured 20,000 doors per month 18 months ago. Then output rose to 30,000 in 2018. HPP recently invested in a triple-fronted warehouse to free up an existing warehouse for production.